In 1971 with the relaxing of the Comic Code Authority, which served as the oversight and moral enforcer for comics, Marvel took advantage of their dropping their longstanding ban on vampire by publishing the comic The Tomb of Dracula in April 1972. Marvel had already tested the waters with a quasi-vampire named Morbius, the Living Vampire, but was ready to go all in by publishing a horror series featuring Dracula. 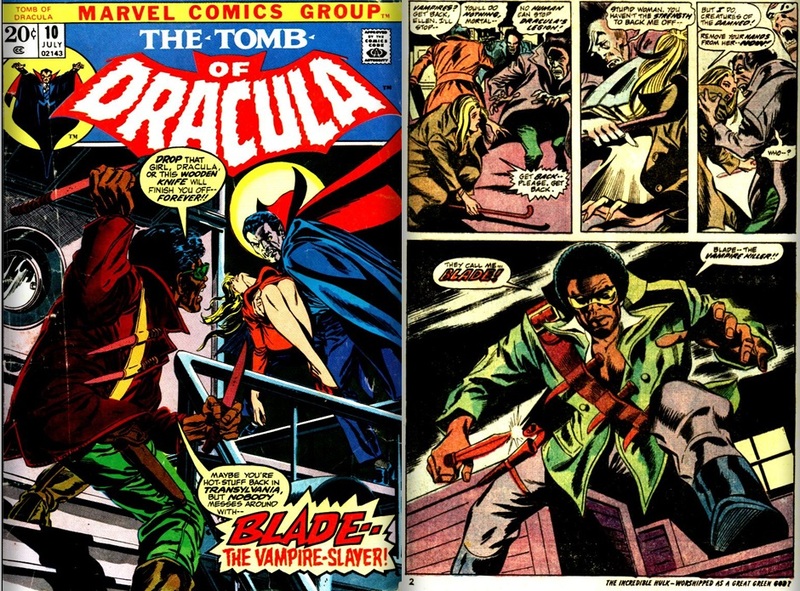 In issue # 10 (July 1973) of the series, we are introduced to a black vampire named Blade. 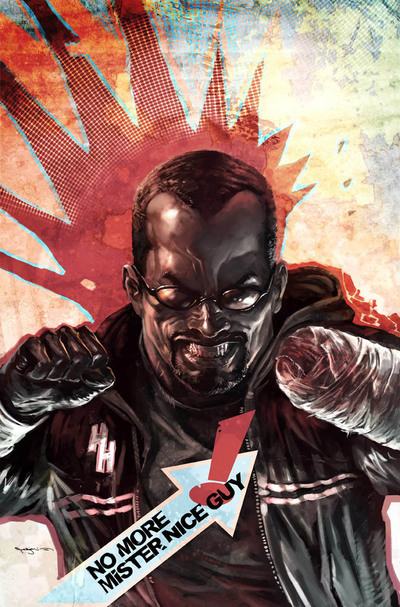 Blade appeared in issues 10-21 and also #24 and #28. Now, we see Blade making his imprint in the post-infinity time, joining Luke Cage’s Mighty Avengers. Let’s take a look back at one the most iconic black heroes in the Marvel U.
Blade was born in the Soho district of London. His mother was a prostitute (or so it was first thought) who was bitten by the “doctor” who was supposed to be helping her with complications from her giving birth. His mother was named Tara Cross, but was sent by her husband Lucas Cross to England to hide while he was imprisoned in Latveria. She had changed her name to Vanessa Brooks and was seeking shelter at the brothel owned by Madam Vanity. The vampire; named Deacon Frost, passed enzymes through his bite on to Blade. The enzymes in turn gave him certain vampiric abilities. Originally these abilities were limited immunity to vampire bites, the ability to smell/sense supernatural creatures, a prolonged lifespan, and sensitivity to bright light. This state is referred to as Dhamphir; one who is touched by vampirism but not converted into a full vampire. As we will find out, later on in his adventures, he will gain some additional abilities. His mother’s “co-workers” were able to run the vampire off before he could kill Blade, and subsequently Madam Vanity raised him until he was nine years old, naming him Eric Brooks. While still a young man, Blade heard a skirmish and rushed in to aid the person. The person turned out to be Jamal Afari, a jazz trumpeter and vampire hunter, and was being attacked by vampires. With Blade’s help, they were able to defeat the vampires, and Afari moved into the brothel and trained Blade in music and combat. Although Blade did not possess superhuman abilities at the time, he was still an Olympic level athlete and highly skilled hand-to-hand combatant. Jamal also trained Blade in the use of teakwood daggers as a means to combat and kill their enemies. Blade was able to easily defeat the younger and weaker vampires, and this made him cocky. The first gang he joined was called the “Bloodshadows” who were led by an older and one of the most powerful vampires that Blade had come across. He was able to defeat the vampire, but lost his girlfriend in the process. He accepted that his destiny was to become a vampire hunter, and dedicated his life to the task. His mentor, Afari, was attacked by Dracula and turned, which made Blade and Dracula eternal enemies, and caused Blade to have to kill Afari. Blade hooked up with another gang, led by Ogun, and included Musenda, Azu, and Orij. They were known as Ogun’s Vampire Hunters, and they hunted Dracula throughout Europe and Asia. In order to teach Blade a lesson, Dracula killed almost all the members of the new group. All though Blade had been outfitted with the appropriate garb to fight in, it wasn’t until now that he got his classic look. Blade took items from each of the slain members: Ogun’s wristbands, Azu’s belt, Musenda’s boots, and two of the most important items, the wooden daggers of Orij whom he greatly admired, and who helped Blade become a master of the blades, and to seal the look, the shades belonging to his original mentor; Jamal Afari. It is important to point out that this was a group of brothers! That’s right, before Reginald Hudlin teamed Blade with the Black Panther, Monica Rambeau, Luke Cage, and Doctor Voodoo,, Blade was a part of a team of black vampire hunters! Blade spent his early years tracking Dracula across the European continent. He aligned himself another group of vampire hunters, led by Quincy Harker, who were also seeking out Dracula. While with this group, he first encountered Morbius in London, and even teamed up with Dracula in America to defeat a more powerful villain. After they defeated the villain, Dracula flees with Blade hot on his trail. Even though he doesn’t catch Dracula, he kills Deacon Frost and got his revenge. During this time he teamed up with Dr. Strange, Frank Drake, and Hannibal King to form Borderline Investigations Inc., which combated supernatural threats, which was renamed the Night Stalkers. They later add Ghost Rider (Danny Ketch), the Darkhold Redeemers, Johnny Blaze, and Morbius to form the Midnight Sons, which also battled the supernatural, and even fought HYDRA. He has come across Daimon Hellstrom, who had to perform an exorcism on Blade to separate him from an evil doppelganger, and was changed into “Switchblade” by the book called Darkhold, in which case, the Midnight Sons were able to use another page of the book to turn him back. The popularity of the character became evident when Blade’s comic book adventures led up to the cinematic debut of the movie “Blade” in 1998. The film stared Wesley Snipes, who at the time was rumored to be starring in a Black Panther movie that was cancelled. The movie gives the origin story of Blade, and introduces us to a character whose own origin came in the 1994 Spider-man animated series which featured a storyline involving Blade and the now famous Abraham Whistler. The movie is easily considered the first successful Marvel comic book movie, and drew rave reviews for both the movie and for Snipes, who went on to star in two sequels. In the last of the sequels, we are introduced to Abigail Whistler who is the daughter of Abraham Whistler, and a young Hannibal King. This version of Blade is dressed in the famous leather trench and sporting the dark sun glasses. He has all the same powers of the comic book version, with Whistler providing him with high tech gadgets used to kill the vampires. The success of the films led to a television series featuring the rapper Sticky Fingerz of the group Onyx. The television series last only 12 episodes before being cancelled. 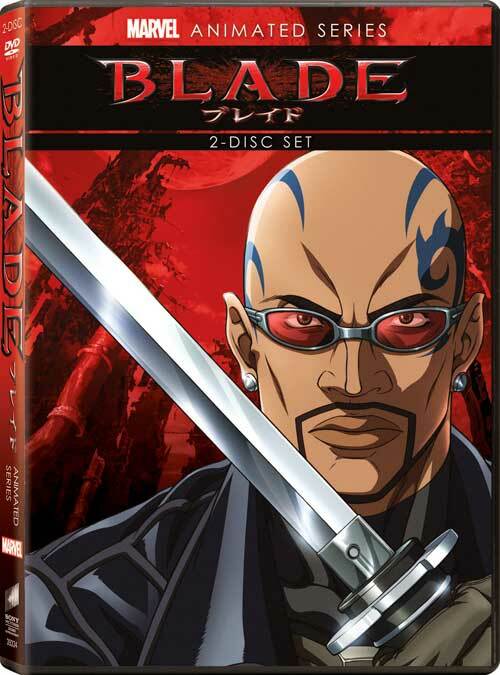 Blade also appeared in the fourth anime project from the Marvel Anime studio. This version of Blade retains all the comic versions powers, and has an advance mastery of the sword. He has learned powerful moves that he performs with the sword that have a devastating effect. Wesley Snipes begins the Superhero Movie revolution! Back in comic book land, Blade is now once again a solo vampire hunter. He is drawn to New Orleans and finds Hannibal King. The two of them team-up to defeat a resurrected Deacon Frost and Morbius, who was being controlled by another vampire. Blade leaves King and follows Morbius to New York, where he defeats him again; this time with the help of Spider-man. During the fight, Blade is bitten by Morbius. 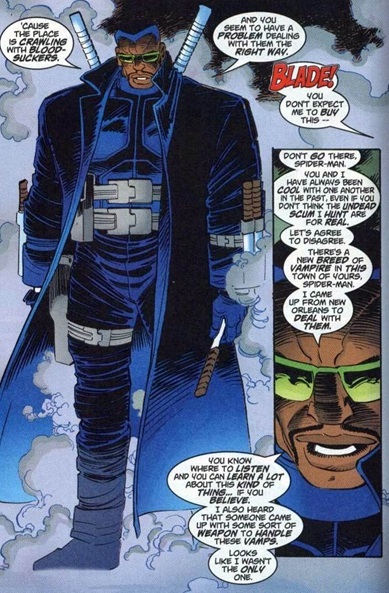 The combination of Morbius’ vampirism and Blade’s anatomy react in such a way to now give Blade all the strengths of a vampire, and eliminates his sensitivity to light. Now, Blade is transformed from a Dhamphir to a Daywalker. (Peter Parker Spiderman #8, Aug 1999) This results in an increase in Blade’s power set. Blade’s strength, stamina, speed, agility, and sense are now at superhuman levels. Blade is also granted a regenerative healing factor just like full vampires, although he cannot regenerate missing limbs or organs. He still retained the one weakness that is common to all vampires; he has to ingest blood in order to survive. He uses a serum in place of blood. If he goes without the serum, he is prone to attack humans for food, and if he goes without blood or the serum for an extended period of time it will be fatal. After fighting against S.H.I.E.L.D., who tried to capture him to use his blood in a vampire cloning project, Blade teams with other vampire hunters to stop Dracula from becoming a god-like vampire lord. Afterwards, he heads back to New Orleans, where he teams up the aforementioned Luke Cage, Brother Voodoo, Black Panther, and Monica Rambeau to stop a imminent vampire infestation, brought on by the Montague siblings, Beatrice and Victor, who were vampires. (Black Panther Vol. 4 #12-13; March 2006, April 2006) He runs into a resurrected Dracula again in New Orleans, and follows him to New York where he kills him (again) aboard a S.H.I.E.L.D. Helicarrier. The Helicarrier was infested by vampires, and was destroyed by Blade. Once S.H.I.E.L.D. caught up with Blade, instead of sending him to jail, they allowed him to register. Now a registered superhero, Blade was able to carry on his vampire hunting, but not before S.H.I.E.L.D. sent him on a mission to kill or capture Wolverine (Blade Vol. 6, #5; March 2007) It was during this time Blade learns the truth about his mother, and meets his father; Lucas Cross, who not only was a white man, but had also been turned into a vampire himself while imprisoned. Upon learning of Cross being his father, Blade remarks that he’s pretty sure he isn’t half-white! (Blade Vol. 6, #6; April 2007) it is during this time that Blade loses his hand. Blade has been a part of a couple of “secret” black-ops squads. The first was called Vanguard, in which he was chosen to lead, and while in the group, receives a cybernetic hand that replaces the one he lost. Their first mission was to find out who murdered the original team leader. 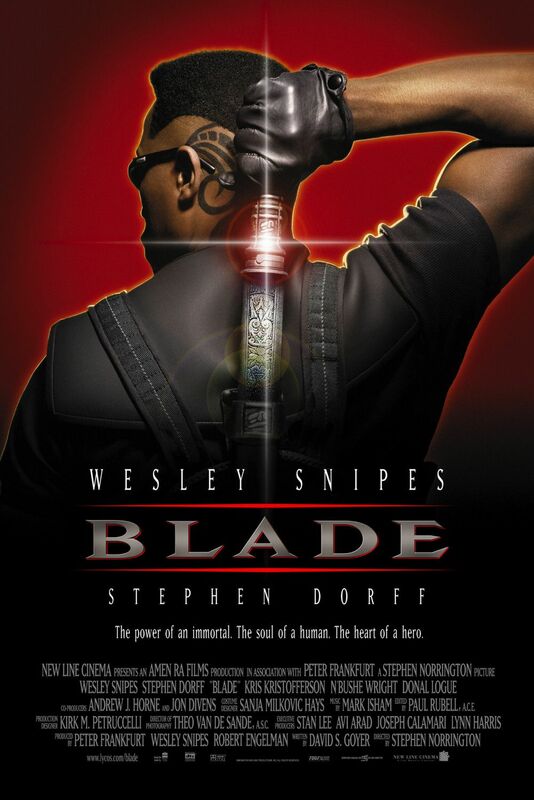 They find the killer, and find the mastermind behind the plot, and go up against a mind-controlled Thing, until Blade shoots the mastermind, a man named Yoosef, in the head. The team finds out that the original leader. Colonel America is still alive, and that the government wants the group disbanded. The government’s plan was to use the Colonel America to kill the rest of the squad. The team makes him believe that he accomplishes his goal, and then they teleport away. Blade is captured and tortured, but gives a bogus explanation why he survived. He made his way back to England and joined MI: 13 under Captain Britain that was formed after the Skrull invasion of Britain. Blade joined to help out with the evil that came back as a result of the Skrulls defeat. He was not warmly accepted at first, due to his attempting to stake his teammate Spitfire. He enjoyed many missions with the team, and was able to mentor Spitfire in the use and extent of her abilities and saving England from a vampire invasion lead by Dracula. While investigating killings of vampire slayers, Blade finds out that Dracula’s throne has been taken from him, and that Dracula’s son Xarius was now the ruler. Blade attacks Xarius’ base during the day and blows it up. He is surprised to see the vampires emerge into the daylight. The vampire slayers are killed, except for Blade, who learns that Xarius plans on attacking Utopia. Blade goes to Utopia to warn the mutants and aid in the battle against the invasion. Cyclops decides that in order to defeat the horde, he needs to revive Dracula. Dracula kills his son and stops the invasion. Blade tries to kill Dracula, but is blasted by Cyclops. Blade tries to get wolverine to stake Jubilee, who was turned into a vampire during the invasion, but Wolverine refused. Blade also appears in the ultimate universe. He first appeared in Ultimate Spider-Man #95, when he saves Spider-Man from being bitten after Spider-Man had webbed him up. Spider-Man saved a discarded wooden stake as prove of the existence of vampires. He is recruited by Ultimate Nick Fury to join his black ops squad called the Avengers. He first comes in contact with Blade when the vampire nation starts attacking superheroes and gathering all the vampires together all over the world to attack the Ultimates base. Blade helps the Ultimates and the Avengers defeat the vampire hordes. Once he joins the Avengers, he shows how powerful he is by placing rampaging Tyrone Cash in a trance and causing him to revert back to normal form. Blade has enjoyed a long and successful career. He has been fortunate enough to never go out of style, and has always been well written. His character is perfect for the type of appearances he has had over the years. With the success of the movie franchise, his popularity has soared above any other “monster-themed” character that has come before or after him. With no signs of stopping, fans will be enjoying this cool character for years to come. LET MARCUS KNOW WHAT YOU THOUGHT OF HIS LATEST ARTICLE BELOW! CHECK OUT OUR UPDATED AND AWESOME BLADE BIOGRAPHY HERE! This was a great blog post! Well-put togther and informative! Keep doing what you do! Nice historical background on the Marvel’s vampire slayer. I tried to watch the TV Series but Sticky Fingaz was no Wesley Snipes. Hopefully there will be a reboot coming. It would also be nice to see if he can be a part of the marvel move universe but I know that is really up to the studios.